Do we have the courage to stand up to corruption and the oligarchy? Many presidential candidates have claimed to be the “people’s president.” It’s a term used to indicate that a candidate is just one of the people, who cares about the issues that apply to the common man; not just the wealthy and powerful. But what if the “common man” decided to run for president? 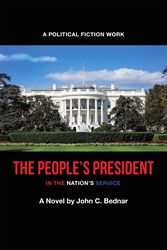 In John C. Bednar’s new novel, “The People’s President: In the Nation’s Service,” he gives readers a glimpse into an alternate reality, where money isn’t the ticket to political office and the underdog has a shot at turning the establishment on its head. Author John C. Bednar has spent his career teaching in higher education. He believes education and individual, civic responsibility are the keys to mending a politically divided nation. For more info, visit: http://bookstore.archwaypublishing.com/Products/SKU-001100922/The-Peoples-President.aspx. John C. Bednar is a retired Professor Emeritus of Clemson University, a member of the Princeton Alumni Association and Shattuck/St. Mary’s Alumni Association. He taught at several universities, including The University of California at Berkeley, Pennsylvania State University and Princeton University, and has served in several corporate executive roles. This is his first novel.